More news on Acton’s supposed “investigation” of the deletion of emails. New documents show that Acton did not even meet with Briffa or Jones in his supposed “investigation” of the deletion of emails. Acton sent Briffa a letter asking him whether he had “knowingly” deleted emails subject to FOI. Briffa wrote back that he hadn’t. That appears to be the entire extent of Acton’s “investigation”. Sort of like Penn State. Also see Bishop Hill on this story here. Acton waxed lyrical about the written statements he had received from Jones and Briffa confirming that they had not deleted emails subject to FOI. These statements, he assured the Tribunal, had been signed in good old-fashioned blue ink. Unfortunately, he went on to explain, they had subsequently been lost. Previously, in response to David Holland’s FOI for supporting documents (see CA here and whatdotheyknow here), UEA had stated that they held “no recorded information that confirms the exact dates that the statements were prepared by the Professors”, that they did not hold a copy of the full statement of either Professor Briffa or Professor Jones” and that they held “no recorded information that would indicate whether either statement was signed by either Professor Briffa or Professor Jones”. Apparently there was some derision from the Tribunal about the statements being “lost”, prompting UEA to actually look for the documents that they had been unable to locate in response to Holland’s request. In a letter to the Tribunal today, the UEA reported that, subsequent to the hearing, on January 17, 2013, Briffa had located an unsigned copy of his statement in a directory which “had not been examined during the course of the University’s previous reasonable search of its systems.” The UEA have now provided a copy of that document, together with a copy of a prior letter from Acton to Briffa, that had prompted Briffa’s letter. The new information sheds a great deal of light on Acton’s non-existent “investigation”, showing just how misleading Acton’s evidence to the Sci Tech COmmitteee had been. … The University takes very seriously the parts of the ICCE report concerning the FOIA, and how individuals, CRU, and the University as a whole, behaved with respect to it. The tone and the content of some of the leaked e-mails have given rise to grave concern, and exposed the University to significant reputational risk. Following your meeting with Trevor Davies earlier today, I would therefore like your written reassurance on some of the concerns that have been thrown up. Specifically, I would like your confirmation of two matters. 1. That you have never knowingly deleted emaiis or files that were at the time subject to a request under the FOIA or the EIR, and that you never will. 2. That you undertake never to suggest to anyone that they should delete emails or files subject to a request under the FOIA or the EIR. In addition, I ask you to undertake, in the clearest possible terms, that you will use your best offices to help deliver a genuine cultural change within CRU to achieve greater openness and pro-active compliance with the FOIA. I am writing in response to your letter of the 26th July, first to thank you for your kind remarks about the positive contribution that CRU has made to the science of climate change and for your appreciation of my own small role. I also note the concern felt by yourself and the University that the CRU should maintain a culture of openness and, of course, complete compliance with the spirit and letter of Freedom of Information regulations. For my part I wish to assure you that I have not knowingly deleted emails or files that were at the time subject to a request under FOIA or EIR, and will not do so in the future. I also assure you that I will not suggest to anyone that they should delete emails or files subject to similar requests under FOIA or EIR. I will use whatever means at my disposal to encourage greater openness and pro-active compliance with FOIA and EIR within the CRU and the wider University. Briffa’s response looks to me like it had been vetted prior to Briffa sending it and perhaps drafted by someone else. Briffa’ statement in Appendix F was a word-for-word quote from the second paragraph of his letter to Acton. Acton and Muir Russell were examined by Graham Stringer in October 2010, at which Muir Russell admitted that he hadn’t asked Jones and Briffa about the deletion of emails, leading to the then surprising revelation by Acton that he had supposedly carried out the investigation that Muir Russell had failed to do. Today’s information shows that Acton’s “investigation” (almost certainly) did not include an actual interview of Briffa by Acton – only a letter from Acton to Briffa and a letter from Briffa back. Now watch Acton’s evidence to the SciTech Committee. Q94 Graham Stringer: … Professor Acton, are you satisfied that these questions weren’t asked, that people in your university were sending out e-mails suggesting that e-mails should be deleted and that hasn’t been investigated? Acton’s answer – that he himself had “investigated” the matter – undoubtedly came as a total surprise to Stringer, as it did to me. With the benefit of the fresh documents, we know that Acton’s “investigation” was nothing more than sending a letter to Briffa and Briffa sending a letter back. Acton’s language here tracks the language of the letters. As so often, Acton did not answer the asked question. In this case, Acton’s freelancing led him into answers that were unsupported by his “investigation” and which were untrue. Acton asserted that the emails in question could be “produced” – this wasn’t true, as Briffa’s memory stick as returned to UEA did not contain some key emails. Acton’s statement that the emails had not been deleted was untrue. The Climategate emails (and especially the CG2 dossier) shows unequivocally that Briffa and Osborn had deleted emails from the UEA computers (while retaining copies on personal memory sticks). It now appears that Acton had not actually met with Briffa or Jones. Watch the pea. Professor Edward Acton: If you examine our website you will find that these statements have been there for some time. Acton later corrected his testimony on this point, to say that the statements had been on the Sci Tech Committee website. Q97 Graham Stringer: Did you ask Professor Briffa why he thought it necessary to take e-mails home? Professor Edward Acton: I didn’t. I can, if it is appropriate, tell you an element that I think may bear upon it, which was that at the time he was gravely ill and rather frequently not in the university. So to take a copy home does not seem to me very extraordinary, but I haven’t asked him. Q99 Graham Stringer: So you don’t think there was any question about security of the e-mails? It was entirely about the health of Professor Briffa? Professor Edward Acton: I’ve told you that it seems to me, in speculating on why he might have done that, that does seem an extraordinarily plausible explanation. My concern is to be sure that they are produced and producible, that they are there and that both colleagues firmly assert that they did not do what is in question. Once again, watching the pea. Briffa’s removal of documents in 2008 had nothing to do with his subsequent illness. Acton once again has misled the Parliamentary Committee. Acton’s assertion that the documents are “produced and producible” was only partly true and again misleading. Briffa had deleted documents from UEA computers and the version available to Acton was available to him because Briffa had returned a memory stick in March 2010 only after the Climategate scandal. Briffa’s statement, quoted to Parliament, also stated that he did not delete “files” – a statement that is evidently untrue as Briffa now claims that he removed only emails (not attachments); thus, his destruction of the attachments on his UEA computer destroyed these files. In summary, Acton’s “investigation” consisted of nothing more than asking Briffa whether he “knowingly” deleted emails and files subject to FOI request and accepting Briffa’s answer without the slightest attempt to seek an explanation for Climategate letters clearly stating that Briffa and Osborn had removed emails from UEA to personal storage. Less thorough, if it can be imagined, than even Penn State “investigations”. This entry was written by Stephen McIntyre, posted on Jan 18, 2013 at 3:57 PM, filed under climategate, Uncategorized and tagged acton, delete, muir russell, stringer. Bookmark the permalink. Follow any comments here with the RSS feed for this post. Both comments and trackbacks are currently closed. Steve, for clarity please check the date given for Briffa’s reply to Acton. I presume this should be that Oxburgh had failed to do. Does anyone but me find the following language exceedingly bizarre in an “investigation”? That’s Acton’s idea of an investigation? He doesn’t even asks questions. Instead,he directly tells the person under investigation to “confirm” to Acton that nothing is wrong … confirm it? Meaning Acton already assumes he’s innocent, he just wants confirmation? That’s pathetic. Perhaps it’s a UK thing, but man, that is not what I would call an “investigation”, or even the opening letter to an investigation. Acton’s actions are nothing but a bad joke. He is not really going for confirmation, he is directing the narrative and asking for plausible deniability for himself. They knew what the conclusions were going to be and it appears, spent the “investigation phase” getting everyone on the same page. It’s not just you Willis. That to me is what is often described as ‘seeking assurance’. Politicians use it when they state that “they have been assured that …”. Everyone knows that means that no active investigation has been conducted, but that the person(s) involved have confirmed their position officially. As in this case. The first part of the question ‘confirm that you have never deleted e-mails’ seems to me to be traditional British middle-class indirectness. To directly ask “Have you deleted mails?” would be considered abrupt and rude, the kind of phrasing a policeman would use to a suspect. Phrased in this way, it shows that Acton (a jolly good chap) knows that other jolly good chaps (Jones and Briffa) would never dream of performing illegal actions and he is sorry to trouble them with these unsavoury and no-doubt malicious allegations. The second part is, I agree, bizarre. How can you confirm something which lies in the future? It is extraordinary to me – I often work from home, and simply use a remote desktop to access my email. Not only is it just as easy, it also means I can see new stuff that arrives after I have left the office, and it also means that there are less security issues – what I take a copy of from off-site is easily logged, mail servers do not need to be opened to the whole of my ISPs IP range (I have dynamic IP at home) and so on. what I take a copy of from off-site is easily logged, mail servers do not need to be opened to the whole of my ISPs IP range (I have dynamic IP at home) and so on. If somebody took a copy of e-mails home, there’d be no reason to have mail servers be opened to any IP ranges. If the e-mails are being transferred by physical media, the servers are unaffected. It’s true there is less logging of what is done, but I hardly see how the improves security when it comes with the overhead involved in allowing the use of remote desktops. I certainly don’t see what it has to do with allowing access to servers from any IP ranges. *Not only does it create a source of risk at the server itself, it also impacts firewalls, routers and the desktops on the network. I worked as an IT Asset Management consultant for 10 years. Absolutely everything I did was via remote laptop, using VPN. That’s not surprising Jeff Alberts. Almost all companies allow VPN connections to one extent or another. Of course, VPNs and remote desktops are not the same thing (though you can use both together). Usually VPNs are going to be easier to manage and more secure for the network than remote desktops. Is there a relevant difference between work done for an entity responsible to the public, as opposed to a private entity? I would answer by saying yes regarding who owns the work done and who has administrative control of it. And ownership is usually defined as those who paid for the work. If the public pays for the work, the public owns it. The government is an agent of the public and administer and control public work. Private work is controlled by private individuals or private companies, corporations, groups, charities, etc. And access, if denied by those private entities, can only be granted by a search warrant as required by law. I suppose you could say FOIA is a sort of public search warrant. IMO, no more than a VPN, and arguably less – you only need to manage the “local” desktops, not someones home PC. However, this is beside the point. Whether VPN or remote desktop, I see little reason to physically move emails on, say, a USB stick. A VPN or remote desktop means you are always “in sync” whether at home or in the office. You don’t manage a person’s home PC when they use VPN. VPN doesn’t care about the home PC at all. In fact, VPN doesn’t care what PC is used. You can use VPN from a different computer every time. Moreover, nothing you said has any bearing on the fact the use of remote desktops requires modifications on multiple network devices causing additional security risks. The reason to physically move e-mails is obvious. Lots of networks don’t allow VPN or remote desktops. It’s simpler, cheaper and less resource intensive if you can avoid remote connections. It’s also more secure that way. Beyond that, an individual might decide not to use a remote connection because he doesn’t know the option is available, he doesn’t want to have to go to IT (who might not allow it) or because he figures it’s pointless as making a single copy of files is easier. Put simply, transferring files home via physical media is not extraordinary. Steve: enough on this unless you can connect it to an actual issue. When Acton asks whether they have deleted “…emails or files that were at the time subject to a request under the FOIA…” does that exonerate deletion BEFORE the FOIA request was made? Steve: irrelevant. They deleted emails from the server immediately after Holland’s FOI request. Worse, they subsequently informed UEA officials about it, who did nothing. It seems that “the world’s top scientists” and their bosses don’t know how email works, don’t know that time has an order to it (getting sick does not cause actions before the date), and don’t know simple logic (as well as Excel apparently). I guess this explains a lot. The phrasing of Acton’s question was also clever. He asked if Briffa knowingly deleted items subject to an active FOIA request, but Briffa could easily have deleted lots of stuff that might become subject to such request at some future time (and did in fact take all such material home on a stick). When there were rumblings about Arthur Anderson getting audited but before the audit, they shredded boatloads of documents–but they should not have done so and got in huge trouble for it, plus it shredded their credibility. Steve: Acton may have been trying to be clever, but the fact is that Briffa and Osborn knowingly deleted emails from the UEA server that had been requested under FOI. It wasn’t done in “anticipation” of a request; it was done following a request. The documentary evidence is conclusive. I agree that the letter from Briffa looks like it was (at least in part) written by somebody else. In particular the name below the (missing) signature “Keith Briffa, Professor” would be a very odd thing for him to write. I might describe myself as “Professor Jonathan Jones” or as “Jonathan Jones, Professor of Physics”, but I would never describe myself as “Jonathan Jones, Professor”. On the other hand a secretary in central administration who had no idea of his job title might very well do something like that. The Briffa letter was drafted by “cjev”. 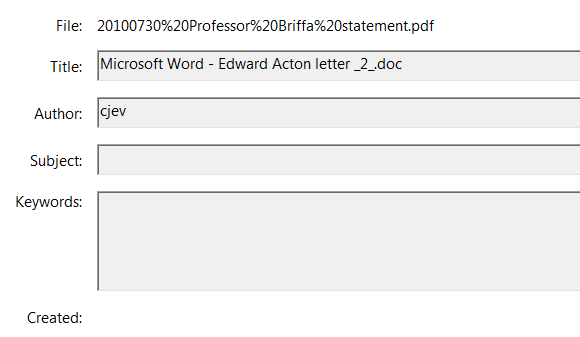 In keeping with Jonathan’s point, the name of the file “Professor Briffa Statement” is surely not how Briffa himself would name his own file. It sure looks like someone sent him the letter to sign. Whether Briffa actually signed the letter is unclear. Signing the letter would be opening himself up since such an assertion would be untrue. Recall Jones’ “Keith should say” email, urging Briffa to make untrue statements about his Wahl correspondence. There is no evidence that Briffa complied with Jones’ request. I’d rate the chances as 50-50 that the letter was sent to Briffa, but that he never returned a signed version. More likely to be someone in legal or PR, or simply an admin in Acton’s office…..
Professors always know their exact title, which is never merely ‘Professor’ when it comes after/below one’s name. Or possibly C.J. Ev-something – don’t discount a middle name. I’ve spent several hours searching UEA and Google for variations on “cjev” and have come up blank. Best I can figure is that it is an abbreviation for “c. jevons” or perhaps somehow related to Jevons Institute for Competition Law and Economics (University College London). Any readers who have further insight are welcome to try. It might have been drafted by their lawyers as well. Mills and Reeve are acting for them on their FOI actions, but I don’t know whether they were used in July 2010. It looks to me like initials. English names tend to be more “conventional” than Anerican. Perhaps: Christopher John Edward V…, Charles James Edward V… , Catherine Jane Elizabeth V…, Perhaps E is for a family surname used as a middle name. cj evans is a possibility. There was a jenny evans (now summers) who is a human resources manager for the science fac. but this doesn’t explain the “c”. I located a near-contemporary document (with document properties) that can be securely attributed to Briffa. He made a 25 June 2010 response to Muir Russell that is on the Muir Russell website in pdf form/ The document properties show the author as “f023”. The embedded fonts are also different than the embedded fonts of the 30 July 2010 “Briffa” letter to Acton. I’ve looked at author properties from other securely attributed CRU documents (e.g. in Climategate 1 documents). Jones’ documents tend to show author as “Climatic Research Unit”. Osborn’s securely attributed documents show author as “f055”. IMO, the evidence is overwhelming that Briffa was not the author of the letter and that the author was not at CRU. Instead, the letter was sent to him – perhaps by someone from Davies’ office, perhaps Acton’s office, perhaps a lawyer. I think that there’s a real issue about whether Briffa ever signed it (though he might have.) Acton’s claim that he “lost” the signed documents is implausible. Plus they haven’t produced any back-and-forth emails about the documents. What if Briffa simply sat on the letter through August without doing anything? I can easily picture Acton assuming that Briffa had signed off on it, when he hadn’t. I can also see reasons why Briffa might not want to sign the letter as it was written, since it was untrue; thus, signing the letter would place him in a jeopardy that probably didnt exist if he did nothing. I went looking for clues on the authorship of the document using the Wayback machine. Although I didn’t find anything particularly useful, I located a Word document detailing an organization chart of the Vice-Chancellor’s office. The author of the document was given as “k361”. From a sample of three, my best-guess inference would be that the “author” might be a license code used by UEA IT staff when distributing university copies of the Word program. If so and if the first letter represents a department of the university, it could well be that the letter was written on a different CRU machine. In retrospect, it is more likely that the “author” code would be the UEA IT ID of the computer itself. Who on earth would use the term “electronic folder”? The term “folder” slightly suggests to me that the document was located in a thematic email archive, rather than a directory. I think the lawyers are just trying to make clear that they located a “soft copy” of the document in a computer system, rather than a printed copy in a physical folder in some filing cabinet. Could the third party references be Muir Russell and his e-mail review of July 2010 with “cjev” originating from the review team? Could “c” be the chair of the email review and “jev” polishing up the typing. – it was necessary for the University to be able to check salient facts in the context of the report; and the University were entitled to be warned of anything that could be relevant to its duty of care to its staff. Therefore UEA were given a near-final draft for fact-checking alone. Let me stress that none of UEA’s comments changed our conclusions or recommendations. However Acton’s letter of 26 July 2010 further reveals the man behind the curtain and the fact that Acton did not himself ask the questions. Following your meeting with Trevor Davies earlier today, I would therefore like your written reassurance on some of the concerns that have been thrown up. I am influenced not only by this matter in my skepticism but along with the Hockey Stick and its extended narrative, it really does exemplify the whole AGW alarmist fiasco. On the one hand there is a plausible hypothesis to look into, that increased CO2 might cause global warming through the greenhouse effect and positive feedbacks. Then there is the argument to at least look at potential public policy responses. In order for this to come to pass, the proponents have to a) do some solid, testable science and consider the results including results that suggest a contrary conclusion and b) present that into the public discourse so that public policy can be debated. In order to achieve b) the credibility of the proponents is paramount as the discourse is not only between scientists behind closed doors. What I find utterly stunning is the complete lack of credibility of so many of the apparently senior people involved. It seems like climate science is significantly populated by the equivalents of Jimmy Saville and Timothy Leary or that it calls on suchlike for character references! The conduct of Acton now coming to light should be front page / lead story like the phone hacking scandal as should that of Muir Russell and of course CRU itself. Mr Madoff will seems ethical beacon of truth by comparison, I don’t think he denies it was all ust a scam from the outset. The pea shell game continues with a lost and found twist. The nub of the matter is what the original statement from Briffa said (in toto). I agree with Willis E. that it appears that Acton used the mail to instruct Briffa on what was needed, thus avoiding any real investigation that he might be required to give an account of. It’s as though he foresaw the Parliamentary Inquiry. Very prescient of Acton. Asking questions sometimes leads to surprising (and embarassing) answers. He avoided this possibility quite adroitly. One wonders if it is a natural talent, or if he had been coached. Now Briffa comes forward with documents that he claims are the “lost” statements. What is the measure of Briffa’s credibility as a man and a scientist? The UEA seems to be much better at losing data than they are at maintaining it. I think you’re mistaken, Steve. It’s not a pea. It’s a bundle of multi-million dollar research grants which happen to look like a pea. A very large, green, leafy pea. It would have been helpful if UEA had Briffa sign the copy of the statement before submitting to the Tribunal. Shouldn’t have been a big deal. Afterall, he signed it once didn’t he? If he didn’t sign it in 2010, why not? It’s time that the governing council at UEA start a new independent, non-statutory inquiry into VC Acton’s performance in this charade as well as the actions of Jones, Briffa and others who operated out of the CRU. People talk about the appearance of impropriety when scandals arise, but in this case the evidence of impropriety is overwhelming. I went through some of Steve’s old posts tonight on Jones and the China Network and that information alone should have alerted the University that the CRU was not living up to its scientific and ethical responsibilities. I spoke on the previous thread of how this is beginning to look like the Sandusky scandal at Penn State. Football at Penn State enriched the university enormously, enhanced its prestige, and thrilled several generations of alumni who in turn contributed generously to the university. In other words, it was a cash cow. The situation at EAU is similar, in that it had earned world-wide prestige and millions in research funding due to research at CRU. Unfortunately, much of the recent acclaim for the CRU was based on dubious science that was used by the IPCC. The Penn State Board of Directors hired former FBI Director Louis Freeh to investigate the Sandusky scandal at PSU. His report excoriated the handling of the affair, which resulted in resignations, lawsuits, and the shaming of a national icon, football coach Joe Paterno. Careful making comparisons to Penn State and Louis Freeh. There is a post at PowerLine which I find persuasive which examined the report and found that Freeh’s criticism of Paterno was not backed up by any evidence in the report. Paterno, although nationally well-known, was not the focus of the Freeh Report, nor should he have been. The focus was the administration. Spanier, Curley, Schultz did not do their jobs, believing as they did that the reputation of Penn State and its football program took precedence over the well-being of young boys. Spanier has protested his innocence by saying he was not aware that Sandusky was a child molester. But he loses either way: either he should have known or did know and did little to stop him. The Freeh Report may have its problems, but consider this: Penn State has agreed to pay $60 million to the NCAA in fines. The Penn State/UEA analogy is valid. In both cases you have an administration trying to cover up for its most famous employees who have brought the university wealth and international renown. It’s arguable that the scandal at UEA is even more damning in that the academic integrity of the school is in question. Of course Penn State also has the Michael Mann investigation problem, which is itself analogous to their Sandusky sham investigation problem. Watch the second part of Acton’s letter and Briffas confirmation ! They only assured that they will not suggest to anyone to delete emails/files under FOIA/FIR request IN THE FUTURE. Acton specifically did NOT ask if such a request happened in the past. Phil Jones’ request to delete emails was, of course, known to every one. They are setting the bar so low that even an accomplished Limbo dancer would have trouble getting under it. Please remind me, which I know already, that you have not done anything wrong. Please tell me that you are not going to do anything wrong in future. Thanks. As Latimer Alder rightly said elsewhere – all done, anyone for lunch? Catherin Janet Francis Evans, a property and wills laywer. Does anyone know if any of those law firms were involved in the investigation? Or if the CPS ever shares resources from other regions? An alternative explanation to yours would be that the word template has never been changed and or the document is a master which has been over written? It seems to me that “of the sort to which FOIA is applicable would be much more useful. Steve: in the present case, I don’t think that much turns on this sort of parsing. Briffa deleted emails that were responsive to Holland’s FOI request and the UEA then said that they did not hold any responsive emails. It’s pretty cut and dried. Steve, I agree with your view with regard to the episode under discussion. I had thought that Briffa had made a promise with regard to future actions which might have been susceptible to the parsing I suggested. “Email messages, including any electronic attachments, created, collected, received or transmitted in the normal course of government business which reflect the functions, business activities, and decisions of government are records. My workstation contains only copies of my government emails. I could delete everything from my Outlook account on my workstation but that in no way would impact the official records which are kept on an Exchange server under the control of network administrators. I don’t have the means to delete any of my emails permanently which would also be directly against government policy regardless of FOIA (AIA in Canada). AIA requests don’t search my workstation but rather the server records. I have no part of this process and no way to affect it. I don’t know how UEA or its IT policies works but employees like Briffa and Jones should not have the ability to delete official emails of which all should be stored and archived on a regular basis. IMO, public employees should never have the administrative ability to delete official government records. I believe taxpayers reasonably demand this. I agree with your observation that employees should not have the “administrative ability” to purge official records, but unfortunately UEA employees seem to have had this ability. The UK Met Office has taken a different line. They’ve tried to argue that Met Office employees participated in IPCC on a “personal” basis even though the Met Office publicized IPCC participation of their employees and paid for their attendance at IPCC functions. David Holland has outstanding issues with the Met Office, with which I’m not up to date. “mpcraig”, you correctly refer to policies on email management, but beware that a hallmark of bureaucracies is that despite all their policies people get away with sloppiness or worse. I’ve seen it with the Canadian and US governments, and expect the same with the UK government (especially given its sorry record of security problems in health care – including people not doing basic anti-malware housekeeping on computers). And of course someone could set up webmail accounts – one version of that is sharing an account, then keeping messages in Draft status on that independent server so partners can read them. Perhaps forensics with court authority could reveal them, but those UK enquirers seem to have avoided exercising what modest authority they did have. Steve McIntyre, I’ve seen administrative passwords get passed around for expediency (such as so the administrative does not have to come across town to fix a problem with the user’s computer). If the administrator does not change them regularly many people will end up knowing them. I’ve seen people deliberately violate policies on not sending confidential information by email then sneer at those who were cautious. Lots of improper things happen in organizations that do not have solid values. Also beware of wrinkles such as a quota for amount of storage on the server, which motivates users to either delete emails they don’t consider worth keeping and/or move emails to local storage. And there’s the matter of employees leaving. People have been impressed that I left files and emails behind, though I culled them for relevancy and ease of use. (Allowed by the government of Canada with permission.) I wanted the value of that costly work to continue to continue to be available to the organization. But I seem to be in a minority – incompetence is everywhere. I also work for a government and this sort of thing happens quite often. What gets saved and what gets deleted is left entirely up to the discretion of the email account holder. We get messages from the sysadmin telling us our email account storage is full so please delete some emails. What does one suppose Briffa’s response would have been to a request by Acton to sign the following: “I swear under penalty of perjury according to the laws of the UK that I have never knowingly or accidentally . . .”? If I was ordered by the VC of my uni to make a formal written statement that I did not break the law, I would not use his first name. Re: Paul Matthews (Jan 20 06:18), in Oxford the correct form of address would be “Dear Mr Vice Chancellor”, but perhaps we’re a tad old fashioned in such matters. HAS, Briffa is Academic Staff, not Academic Related (it’s a techncal distinction in UK academia). But I see from http://www.uea.ac.uk/calendar/section2/committees/coucoms/arsrc that the current secretary of that committee is the Human Resources Manager, and that’s a plausible person to be involved in correspondence of this kind. Yes, should have spotted that. I think it is difficult to see how jenny evans becomes cjev, but as I noted earlier she is in HR and I’ve just realised that at that time her responsibilities were for the Central Units that include the VC’s office. How did Acton know that Briffa had met with Trevor Davies? Who told him and what did they tell him? It seems odd that Acton would preface his “therefore” two questions with the remark about Trevor Davies. What was the relevance? I was reading around today, and happened upon an older story on Reason that so very much reminded me of the “Climate Control For The Good Of Humanity” deal when it comes to research and releasing data and the like. Institutional sorts of things. The timing of this resurrection (re-construction?!) of these mirabile dictu pieces of “evidence” in support of the Acton’s claim to have “investigated” the matter of deletion of emails subject to FOI is highly suspect, IMHO. Since Acton claims to have conducted this “investigation” why wasn’t he at this purported meeting with Davies? Where are the minutes of that meeting, one wonders, and what might they reveal? As for “concerns that have been thrown up” … I’ve heard of barriers being “thrown up”, but concerns?! Aren’t concerns usually documented – rather than “thrown up”? Oh, well, perhaps Acton had originally written “concerns we couldn’t get thrown out between July 2 and July 7″ but, because he was reluctant to … uh … give up the “thrown” … in keeping with the “ethos” he decided to change it to the rather inarticulate – if not meaningless – “concerns that have been thrown up”. There was no obvious connection between Russell’s deletions and the laptop. Russell knew that I wanted his emails because I had asked him. He had discussed it with his solicitor and refused because he was advised that he was not subject the FOISA or EISR. We know each others email addresses, yet, before he deleted his Review emails, he asked the UEA rather than me if I had appealed the Commissioner’s decision that they were not held on behalf of the UEA. Russell used his existing personal email address and so had to selectively delete the Review emails some time after 8 May 2012, unless he had already segregated them. Either way he could have put them on a CD and put them with the rest of Review records held by his solicitor. Almost certainly the most important Review emails are long since deleted. The lap top almost certainly surfaced as a result of an FOI to the Royal Society of Edinburgh, which rather nobly subjects itself voluntarily the Scottish FOI legislation. It had been asked in 2010 but found no responsive information, even though it had been paid some £27,500 for its work on the Review. For it money the UEA paid for the services of the RSE’s William Hardie, who rather than use an RSE or a cce-review.org email address set up a tiscali web email account. The UEA failed to redact every email address and most if not all the review team addresses were revealed in one place or another. A brave Scot recently asked for all Mr Hardie’s emails using the tiscali address and I suspect that is how the laptop was revealed. The more I look at the evidence the more certain I become that the Review was a sham supported at the highest levels, but we are still waiting to see what the Tribunal has decided. Whatever it is I will have no criticism of it. Thanks, David, for these additional details which do not diminish my belief that CRU/UEA’s “ethos of minimal compliance” may well be contagious! Incidentally, please correct me if I’m wrong, but was it not your rather critical FOI request that just happened to have been omitted from the list of FOI requests that UEA had provided to the “Review Team”?! Thereby, perhaps, offering an avenue of “excuse” for MR to claim that they had seen no evidence of deletion of emails subject to FOI? I cannot disagree with your conclusion that “the Review was a sham” – and I doubt that they could have gotten away with it without (as you say) support at at a high level. One can certainly hope that the Tribunal has cottoned onto the games these people play – and that their decision will be one of “natural justice”, rather than one of “justice under the influence”, so to speak. If the Tribunal were to “do the right thing”, it might go some way towards ameliorating the disrepute of the process resulting from the very shabby handling of Sugar vs BBC and Newbery vs BBC. It looks contagious but I think the Review team were selected because they had already had ‘deletitus’ and the whole thing is a bit like a matryoshka doll. Steve McIntyre first noticed that the Russell Review never listed my request FOI_08-31 on its website as one that it was investigating. Like other important information, which Russell also sat on for months, it was only put on the web after they were sure that we critics were busy reading their embargoed copies of the Review Report on 7 July 2010. Recent disclosures by the UEA shed a bit more light on the matter. When I have a bit more time I will explain. Now I have to get submission in to the Tribunal on a Met Office case. Now I have to get submission in to the Tribunal on a Met Office case. Perhaps Andrew’s next (eminently readable) book will be a history your trials and tribulations on the battlefield of the “climate wars”? I know you always say that you agree . . .
Acton mercilessly extracted a denial from Briffa by email. He’s a pit bull! Isn’t all of this a fantastic reason to simply redo the investigation? It seems to me like this investigation is going nowhere. It just keeps going from investigation to investigation and months pass inbetween. It’s probably still going to drag out for months to come. ACTON: We are the Investigators Who Send … Emails! BRIFFA: No! Not the Investigators Who Send Emails! JONES (aside to Briffa): Who are they? BRIFFA (aside to Jones): Those who receive them seldom live to publish another proxy! ACTON: The Investigators Who Send Emails demand … a sacrifice! BRIFFA: Oh, Investigators Who Send Emails, we are but simple scientists who seek publish studies and clean out our inboxes every once and again. BRIFFA: Ow! Ow! Ow! Agh! ACTON: We shall send you emails until you appease us. BRIFFA: Well, what is it you want? ACTON: We want … a reply! BRIFFA and JONES: Ow! Oh! BRIFFA: Please, please! No more! We will send you a reply. ACTON: You must respond to our email or else you will never publish again! BRIFFA: O Investigators Who Send Emails, you are just and fair, and we will respond to your email with a lengthy reply. ACTON: One that looks persuasive. ACTON: And not too formal.